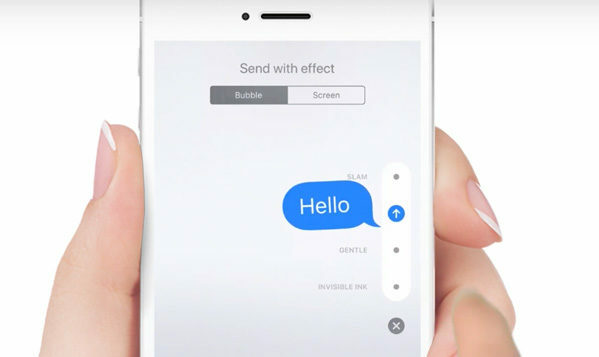 The purpose of this article is to show you how easy it is to add bubble and screen effects to iMessage using your iPhone or iPad. Sending iMessage texts with effects has really made the entire service a lot livelier. You can add bubbles slam, loud, invisible, gentle or even do more dramatic effects like changing the screen to lasers, fireworks and shooting stars. Anyone can understand how to do this, as the process is very simple. Even if you aren’t tech-savvy, it is not complicated to follow these directions⬇. Open iMessage and select the conversation you wish to have added effects. Select the bubble tab if it isn’t already chosen. It is located in the upper portion. Those simple steps have added bubble effects to your message you sent. To cancel a bubble effect, all you have to do is tap on the cancel button (cross) which is located beside the message you will reenter the thread. From the menu that you now know how to access, you will see that there are currently 4 types of bubble effects that you can use. Slam: As the name would suggest, it slams your message on the screen. Loud: A massive bubble which shakes and then falls down into place. Gentle: Small bubbles that slip quickly into place. Invisible: Message is not able to be seen until it is tapped on by the recipient. Interesting fact: updated Mac OS supports the bubble effects from iMessage. Long press the send button and click on the tab in the upper portion that says “Screen”. Echo: Your text duplicates and floods the screen of your recipient. Spotlight: It literally shines a spotlight on the message you are sending. Balloons: Sends multiple colored balloons across the screen beginning in the bottom right corner. 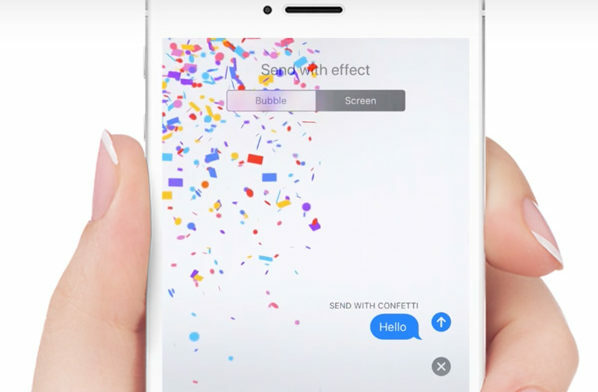 Confetti: Drops confetti from the notification bar on the screen. Love: A gigantic heart appears and pops out from your latest message. Lasers: Turn your screen into a mini rave with house music, lasers and sounds. Fireworks: Shoots fireworks from the center of the screen. Shooting Star: Looks a lot like “The More You Know” shooting star that streaks across the screen and explodes on the right side of the thread screen. Celebration: Fireworks, sounds, and festivities for everything you want to celebrate. You can cancel screen effects as well, you just have to choose the cross icon (cancel) below the message. You can easily replay certain effects even after they have been received by the recipient. You have to open the conversation in question and selecting the individual message. If you received a message with effects and want to play them again, select the message and then tap on the replay button to see the attached effects once again. Here are a couple of tips to help you here. While you have reduced motion turned on, there is an option that allows you to see iMessage effects even with this feature still active. To get there, go to Settings, then General, Accessibility, and Reduce Motion. If it is not ready, turn it on. In this menu, turn on “Autoplay Message” position. If you have any questions or concerns about any of the effects available in iMessage, drop a comment below and I will get back to you as soon as possible.